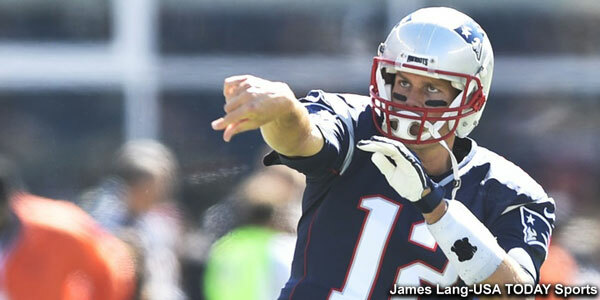 As if we didn’t already know, this skinny kid from Michigan is pretty good… Patriots QB Tom Brady passed another milestone on his way to the Mount Rushmore of quarterbacks by passing for his 400th touchdown pass in the Patriots 51-17 shellacking of the young Jacksonville Jaguars on Sunday in Foxboro. Brady hit Danny Amendola in the back of the end zone for his career milestone and in true Patriots fashion; neither Amendola nor Brady made a big deal of the spectacle. Brady later laughed at Amendola’s faux pas as the WR forgot that the touchdown was number 400 and handed the ball to a fan. Brady later in the game passed for #401 to new wide receiver Keshawn Martin. “I’ve been a part of so many great teams and played with so many great players. 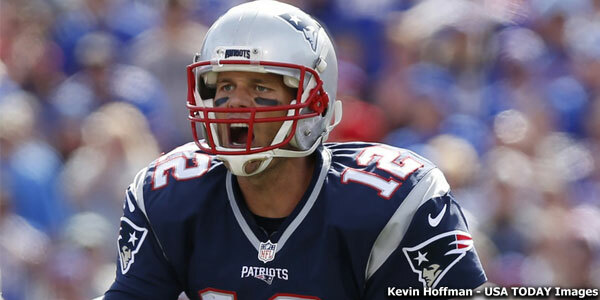 I’ve always said, ‘I don’t care whether we run it in or throw it in, as long as we score points and are winning, it makes it fun for me,” Brady said. Brady has been a remarkably stable presence for a franchise that was anything but in its early days. Many fans weren’t even born during the Patriots nomadic days of drifting in limbo between Fenway Park, Harvard Stadium and BC’s Alumni Stadium before finally getting a permanent, albeit substandard home in the old Schaffer Stadium. The quarterback play in those days was largely substandard as well, with the likes of Mike Taliaferro, Joe Kapp and many others that marked years of struggling offenses. Those days are long gone as fans can now take for granted the excellence that they witness every week. Brady systematically carved up this young Jacksonville team just like he did the much bally-hooed Bills defense the week before. The Patriots scored every time they had the ball on Sunday, save for a pair of Jimmy Garoppolo kneel downs at the end of the game. They rolled up 471 yards of offense with Brady passing a crisp 33-42 for 358 yards and two touchdowns and more importantly no interceptions. The team rolled up 35 first downs and was 11 of 14 on third downs including six of eight in red zone attempts. Those team stats were the ones Brady was more interested in speaking about. Brady resides in 4th place among the all-time touchdown passers behind Peyton Manning, Brett Favre and Dan Marino, however one other stat should be looked at when comparing the top four. Interceptions…Favre resides at #1 with 336 career picks, Marino is 8th with 252, Manning in 13th place with 237. Brady? He’s way down at 61st with 143. There really is no comparison among who’s the greatest any more. Gostkowski Sets NFL Record with 424 straight PATs: Patriots kicker Stephen Gostkowski has been remarkably durable and steady in his NFL career since replacing Adam Vinatieri in 2006. Gostkowski’s 423rd straight PAT on Sunday broke the previous record set by Matt Stover and will be a tougher one to best now that the extra point has been moved back. Gostkowski last missed an extra point during Week 17 of his rookie 2006 campaign. Blount, Lewis Look to Be a Dynamic Dou: LaGarrette Blount was a much bigger part of the offense on Sunday as he and Dion Lewis shared the reps against Jacksonville and were impressive. Blount carried the ball 17 times for 78 yards mainly in the second half and scored three touchdowns. Lewis played most of the snaps in the first half and carried eight times for 37 yards and a touchdown and also caught five passes for 30 yards on Sunday. With Brady efficiently eviscerating the Jaguars secondary, it allowed the team to run the ball more and to close out the game with the run, which they did. The team rushed 32 times for 125 yards and four touchdowns. Martin Makes nice Patriots debut: WR/KR Keshawn Martin made his first appearance with the Pats and showed that the Houston offense is indeed very similar to that of New England’s. While many wide receivers struggle to pick up the Patriots offense, Martin seemed quite comfortable out there and chipped in three catches for 33 yards and a touchdown. While his performance wasn’t earth-shattering, it showed a nice grasp of the playbook for just about 10 days worth of work. 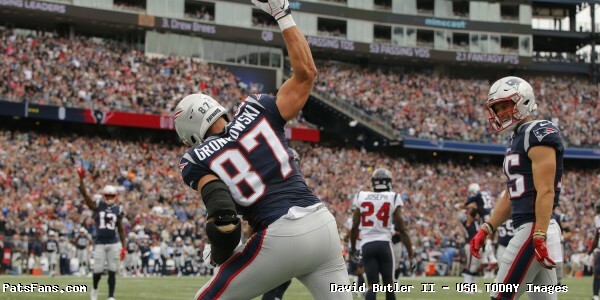 And the fact that Brady went to him in the end zone speaks volumes about the trust he’s already earning in practice. The depth at WR just increased a bit and once Brandon LaFell returns, the team will have the good problem of trying to figure out how to keep all of them involved. 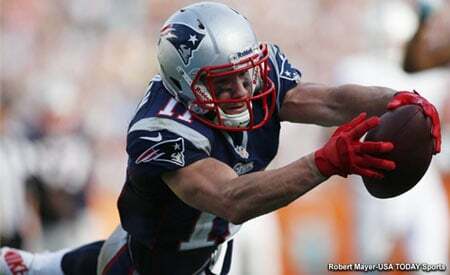 Stalwarts Julian Edelman had another impressive day at the office with 8 catches for 85 yards while TE Rob Gronkowski tallied just four receptions but for 101 yards, mainly in the first half as the Pats rolled easily. Defense has a nice day: Save for one drive in the first half where Jacksonville went on a 17-play clock-killing touchdown drive, the Patriots defense answered the bell and played much stronger on Sunday especially against the run. The Jaguars wanted to run the ball effectively and limit Brady’s chances but rookie T.J. Yeldon couldn’t get untracked against the Pats front seven. Yeldon rushed 11 times for just 33 yards and as a team averaged only 2.8 yards per carry, rushing for only 57 yards on 20 carries. 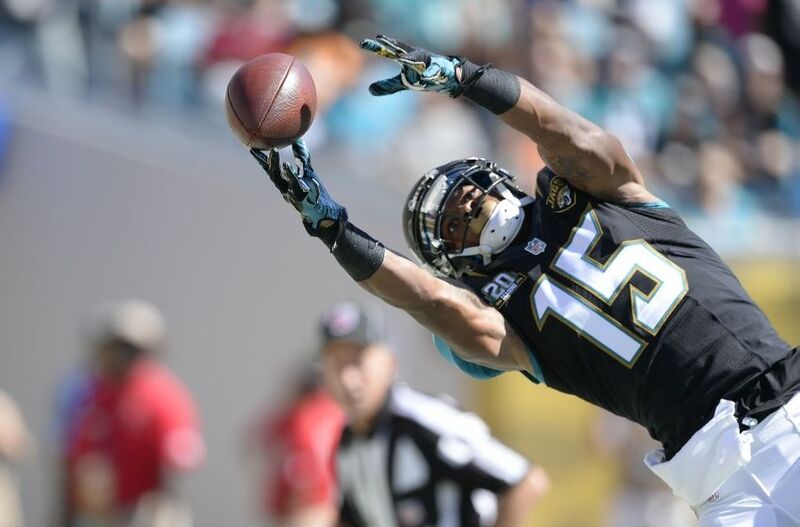 The secondary bottled up the young and talented wide receiver corps of Jacksonville pretty well on the day. Prior to a garbage time touchdown drive with under two minutes left in the game, Jags QB Blake Bortles was only 12-26 for 162 yards with a touchdown and an interception. The front seven didn’t get much pressure on Bortles but the coverage for the most part was good. Newcomer Justin Coleman playing in place of game-day inactive Bradley Fletcher was competitive. Rookie second round draft pick Jordan Richards showed up well in run support especially. The Patriots now enter the bye week with a 3-0 record and after an emotional win on the road in Buffalo came out in a workman type situation and dismantled a game but overmatched Jaguars team. And now they have two weeks to prepare for the Dallas Cowboys. They’ll probably do some self-scouting early this week before cutting the players loose from Weds-Monday for some down time. 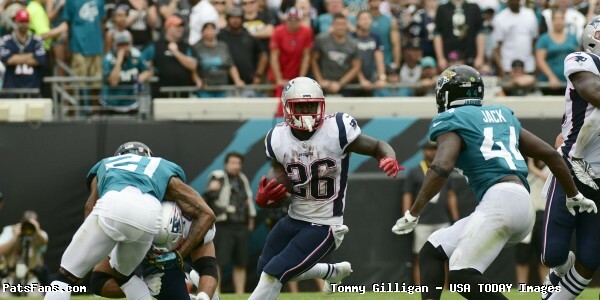 This entry was posted in Patriots Commentary, Patriots Milestones, Patriots News and tagged 2015 NFL Season, Bill Belichick, Blake Bortles, Brandon LaFell, Danny Amendola, Foxboro Stadium, Jacksonville Jaguars, Jimmy Garoppolo, Jordan Richards, Julian Edelman, LaGarrette Blount, Malcolm Butler, New England Patriots, NFL, Patriots, Rob Gronkowski, T.J. Yeldon, Tom Brady on September 28, 2015 by Steve Balestrieri.